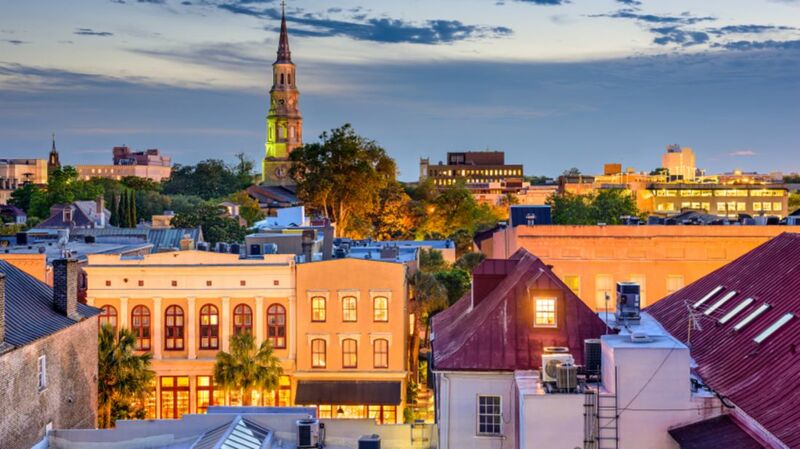 South Carolina’s largest city is long on history and steeped in Southern charm. It’s also distinctly modern, with a lively performing arts scene and a lineup of foodie-approved restaurants putting a contemporary spin on Lowcountry favorites. There’s also Bill Murray. Here are a few things you might not know about Charleston. 1. In 1663, England’s King Charles II awarded the Carolina territory to eight loyal friends who had helped him regain the throne after years in exile. In 1670, the first expedition sailed across the Atlantic and established the province’s first settlement, which they called Charles Town. The name would hold until after the American Revolution, when victorious colonists shortened the name to Charleston. 2. The Ashley and Cooper Rivers, which border Charleston’s historic central district, are named for the same man. Anthony Ashley Cooper, formally known as the 1st Earl of Shaftesbury, was one of King Charles’ buddies—or “Lord Proprietors,” as they were known. He’s credited with picking Charleston’s location (just west of where it’s currently situated), and with establishing a progressive “Grand Modell” for the town’s development along with his assistant, John Locke. 3. In 1761, two tornadoes—one barreling down the Ashley River, the other down the Cooper River—converged over Charleston’s harbor. So powerful was the combined twister, one witness wrote, that it “ploughed the Ashley River to the bottom and lay the channel bare.” Four people were killed and five ships sunk. 4. Charleston was the frequent target of pirate attacks in its early days. In 1718, none other than Edward Teach, a.k.a. Blackbeard, attacked several ships trying to enter the harbor. He took hostages and ransomed them for a chest of medicine. 5. Up until the early 19th century, Charleston had the largest Jewish population of any city in North America. Historians trace this to Cooper and Locke’s original charter, which expressed tolerance for all religions—well, except for Catholicism. Cooper and other English royals were not on good terms with the Roman Catholic Church. 6. In 1776, colonists holed up in a makeshift fort on Sullivan's Island traded fire with nine British warships bent on conquering Charleston. The fort’s commander, William Moultrie, called it “one continual blaze and roar.” The battle lasted several hours, but Fort Sullivan’s palmetto logs held up against the barrage, and eventually the attacking fleet retreated. The effort staved off British occupation for four years and became a symbol of American resilience. The fort was renamed Fort Moultrie, in honor of its commander, and South Carolina adopted the flag Moultrie flew as its state flag, adding in an image of a palmetto tree for additional symbolic value. 7. Another famous fort didn’t fare as well, of course. In 1861, Confederate forces fired the Civil War’s first shots on Fort Sumter, situated in Charleston Harbor. According to writer Mary Chestnut, locals took in the 34-hour spectacle in a very Southern fashion: Sitting on their porches, toasting to the event. 8. Stroll around Charleston and you’ll notice numerous homes accented with a dark green known as Charleston Green. The story goes that after the Civil War, the Union sent buckets of black paint for residents to use when fixing up their damaged homes. Rather than use only Yankee black, however, citizens mixed in a bit of Southern yellow and created the distinctively dark hue. 9. In 2008, the Toni Morrison Society—inspired by her comments about the need for memorials dedicated to the victims of America's slave trade—built a bench on Sullivan's Island, where nearly 40 percent of slaves landed following the Middle Passage. This was the first monument in the society’s “Bench by the Road” project, which has placed benches around the world in locations significant to slavery and black history. 10. There are numerous stories about why the colonial-era houses along Charleston’s Rainbow Row are so colorful. One states that the colors helped drunken sailors identify their lodgings, while another says merchants used them to identify goods sold in each building. The truth, though, is decidedly less colorful: In 1935, a judge and his wife decided to paint their home a lively pink, and their neighbors followed suit. 11. On August 31, 1886, the largest earthquake ever recorded in the southeast United States occurred near Charleston. The 7.8-magnitude quake, which damaged buildings in states as far away as Ohio, killed 60 people and caused more than $5 million in damages. Included in that estimate were more than 14,000 destroyed chimneys. 12. A local orphanage significantly influenced the development of jazz music in South Carolina and throughout the U.S. Established in 1891 by the Reverend Daniel J. Jenkins, the Jenkins Orphanage taught its young residents how to read and play music on donated instruments. It also formed the Jenkins Orphanage Band, which traveled the country. Over time, the students developed a swinging style that became a hit with audiences far and wide. While touring in New York, the band’s playful dance moves (borrowed from Charleston’s Geechie culture), inspired composer James P. Johnson, who composed a song called “The Charleston.” Along with the accompanying dance, it quickly became a nationwide craze and a symbol of the jazz age. 13. Local author DuBose Heyward’s 1925 novel Porgy offered readers a look at Charleston’s Gullah community, and inspired George Gershwin’s folk opera Porgy and Bess. To get a close look at the culture of Catfish Row, in 1934 Gershwin decamped from New York and spent the summer living on Folly Island, where he composed alongside Heyward. 14. In 1969, workers at the South Carolina Medical College Hospital went on strike to protest substandard pay and working conditions for minorities. The strike, which lasted four months, resulted in improvements for employees, and became a model for healthcare labor efforts. It’s also seen as a seminal moment in the Civil Rights movement, having drawn the support of such luminaries as Coretta Scott King and Ralph Abernathy. 15. For seventeen days every summer, Charleston’s theaters, churches, and other performance spaces fill up with live music, plays, operas, and dance numbers. The Spoleto Festival, modeled after a similar festival in Italy, features new and established performers from around the world. Yo-Yo Ma played at the inaugural festival in 1978, shortly after graduating from Harvard [PDF]. 16. The first theater in America, the Dock Street Theatre, was built in 1736 on the corner of Church and Dock Street. It burned down just a few years later, in 1740, but 200 years later the city built a new Dock Street Theatre, which continues to stage performances to this day. 17. And speaking of firsts, the Charleston Museum is widely believed to be the country’s oldest museum. Founded in 1773 as a storehouse for natural and local history collections, the museum is today dedicated to preserving and showcasing artifacts from South Carolina’s Lowcountry. 18. Charleston may not have a pro sports team, but it does have a Gaelic hurling club and a roller derby league called the Lowcountry Highrollers. 19. Charleston’s minor league baseball team, meanwhile, is partly owned by Bill Murray. Because of course it is. Murray, whose official title with the team is “Director of Fun,” owns a home near Charleston and can be frequently spotted around town. 20. The city’s restaurant scene has exploded over the past several years, with chefs like Sean Brock and Mike Lata putting a contemporary spin on traditional Lowcountry cuisine. Husk, one of the city’s hotspots, only sources ingredients from below the Mason Dixon line, while Xiao Bao Biscuit serves what it calls “Asian Soul Food.” Of course, establishments like Martha Lou’s Kitchen and Bowen’s Island Restaurant, which have been pleasing locals and tourists alike for decades, may wonder what all the fuss is about. 21. South Carolina’s oldest public building is a former gunpowder storage facility called the Powder Magazine. Built in 1713, back when Charleston was walled in to protect against land and sea attacks, the small building features three-foot thick walls and a thin, gabled roof—an ingenious design that, were all that powder to ignite, would send the explosion shooting upwards rather than outwards. 22. One of Charleston’s most famous sons, Stephen Colbert, grew up on James Island. After his father and two brothers died tragically in a 1974 plane crash, Colbert’s mother moved the family to East Bay Street in the city’s downtown, where she ran a now-defunct bed and breakfast. 23. The Charleston City Market is one of the country’s oldest public markets. First opened in 1804, it featured meat, fish, and vegetable vendors, and was notorious for the flocks of buzzards (affectionately called “Charleston Eagles”) that would swoop down for scraps. These days, the market features an enclosed, air-conditioned Great Hall as well as open-air sheds selling everything from handmade baskets to stone-ground grits. 24. The first golf club in North America, the South Carolina Golf Club, opened in 1786 on a peninsula field known as Harleston Green (really!). Back then, the ball was known as a “feathery,” and the holes didn’t have flags, tee boxes or a putting green. 25. All of Charleston’s traditional multi-level homes, or “single houses,” feature piazzas that face south or west in order to take advantage of cooling breezes. Back in the 18th and 19th century, that was the closest residents could get to air conditioning.